The eGift card can be used for any book or CD on our website. 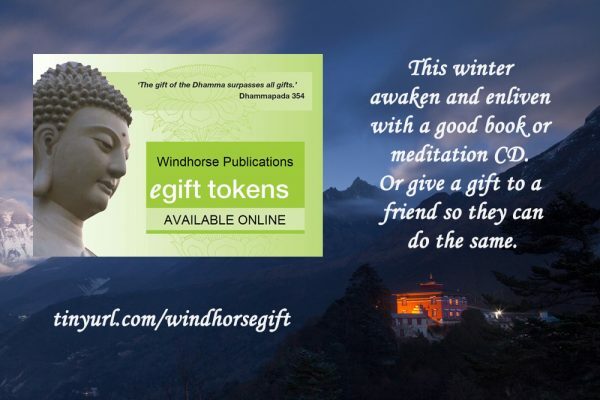 Whether it be Change Your Mind, the beginner’s classic to meditation, Great Faith, Great Wisdom, the new and imaginative book on the Pure Land sutras, or Bodhipaksa’s newest compassionate meditation CD, the eGift card allows the recipient to choose the book or CD that speaks to him/her. For a substantial and generous gift, subscriptions to all twenty-seven volumes of The Complete Works of Sangharakshita can now be given. Subscription options include eBook, paperback and hardback. And for the lighter side, don’t forget a bit of mindful colouring can be done with the Windhorse Colouring Book on dark, winter days. May you and yours be well this season.